Driving up to the mountains with your pet is a no brainer for some Colorado drivers. It’s a lot of fun having them on the trail or the campsite. Spending time together can ensure you create lasting memories for years to come. But many find it difficult to drive safely with their pets in the vehicle. Our pet-loving staff has brainstormed a few different tips that you can use to keep both yourself and your pets safe when driving. It’s important to keep the pet’s ID tags current and ensure that their tags are attached firmly to their collar. This will help if they somehow escape out of the vehicle when you stop for gas or a quick meal. If your pet doesn’t have any tags at this time, make it a priority to ensure they have current tags before you set out on the road. Make sure that the pet always has someone with them while you’re away from the vehicle. Not only will leaving your beloved pet alone get them agitated and more likely to try to escape from the vehicle, but it can also be potentially dangerous to leave them in the vehicle over a period of time. The interior of cars heats up quickly, and leaving your pet locked in the vehicle can cause them to fatal harm. Its also not a good idea to leave your dog in the car in colder months. If you’re taking your pet with you on a cross country road trip, you should build the ideal transportation space for them. This space might be a leftover crate or an effectively designed cage, but it should fit a number of parameters. Your pet should have enough room to comfortably sleep and move around within the space. The container should also be designed so that it can be securely fastened with a seat belt. This will give your pet the optimal level of security during the drive. 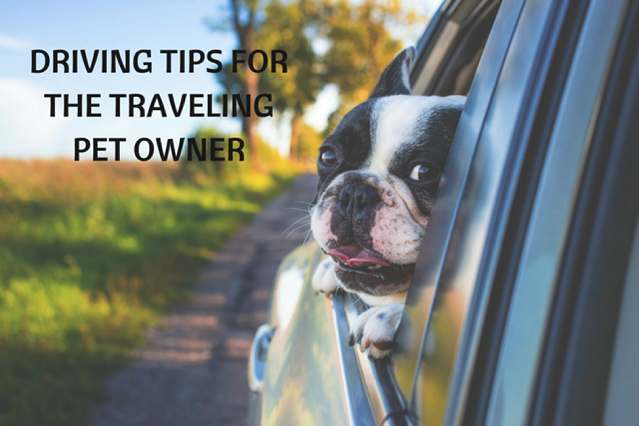 Your pet may become overly stressed if this trip is longer than usual. They should be acclimatized to the traveling process so that their stress levels can be lessened and they can begin to enjoy the drive. Try to begin this process by taking them on shorter journeys before your larger trip. This will also give you the opportunity to learn more about how they react during the drive, and to correct any behaviors that might cause a problem on the road. On any road trip, things rarely go exactly according to plan. Don’t just assume that you’ll be able to stop and get fresh water for your pet when you need it. Bring along some bottled water, or even tap water stored in plastic jugs. Dogs should drink approximately one ounce of water per pound of bodyweight each day. Obviously, this means that larger dogs need more water than small dogs, so it’s imperative that you plan to bring as much water as necessary. Another way to keep you pet safe is to make sure you’re prepared for any situation that arises when driving. A high-quality driver’s institute can help you learn the rules of the road, and keep you safe in adverse weather conditions. Click here to learn more about our courses. Our expert team is available today to help guide you with tips on staying safe while driving with your pets. To learn further safety tips, enroll in one of our courses today! And learn more about parallel parking tips!